Behind every great guitarist there’s a great guitar technician. The guitar technician doesn’t just know how to play and tune the instrument, they know it inside out. They understand the materials, the construction and how it all fits together. This is an interview with Tom Calcaterra, Tom works as a guitar tech on the road since many years for different bands and acts and was so nice to answer our questions about his work, life on the road and his experiences. Tom is Richard Bennett’s guitar tech when he’s on the road with Mark Knopfler. Q. Hi Tom, nice to meet you. Can you tell us where you come from and how old you are? A : I live in New Jersey, a town called West New York. That may sound strange but the town is directly across the Hudson River from Manhattan. As far as age goes, let’s say with 35 years in the business that I’m a seasoned professional. 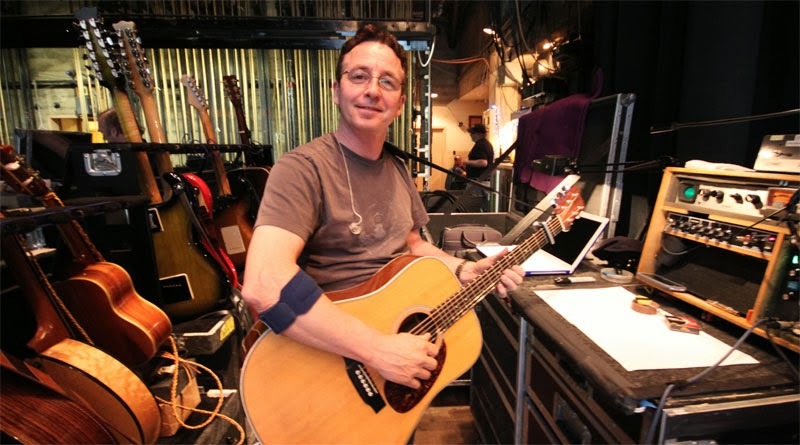 Q. It’s well known that you are Richard’s and Guy Fletcher’s guitar tech during almost all of Mark Knopfler solo tours. Can you tell us how you became evolved in music business, I suppose you had interest for playing music in general? A : That journey was unexpected. However as a kid I did have a love of music and friends that had guitars that I could pick up and play occasionally. Q. Do you play other instruments beside the guitar? A : I have sat at the piano more then once and enjoyed exploring the keyboard. Q. Do you play in a band yourself or would you like to do that? A : No I’m not in a band or have no interest in being in one. The guitar is more of a personal pleasure for me. Q. How did you come in contact with Mark Knopfler’s band? A : Like most gigs I have done, it came to me from people I have worked with before. Robert Collins (FOH engineer for Eric Clapton & Dire Straits) asked me to do the 1996 Golden Heart tour shortly after we both finished the Clapton tour 1995. I was looking after Andy Fairweather Low for the Clapton band for a few tours. Robert hired almost the entire Clapton crew. Q. What skills or education do you need to do this job in a proper way? A : For me it was easy. I’m sure my trade school education helped a great deal. I had electrical, carpentry, automotive shops and loved working with my hands. As a kid I would take things apart just to see how it worked. Even now I still do! Q. In fact you have to be a musician, electrical engineer, and bench technician,you need to have a good ear, be a proficient troubleshooter, and be capable of making a quick fix? A : I would have to say yes to that. Q. Well, with all these skills you can run your own guitar store perfect, ever thought about that? A : I did at one time but life with a touring band and crew just seems to be hard to put down. Q. Can you describe us a typical day on tour: pre show, during the show, and post show? A : Some days are typical but most are not, it depends a great deal on where you are in the world. Q. You have to do routine maintenance and repair the instruments, replacing strings, adjusting intonation, and making modifications based on the musician’s notes from the night before. Also replace speakers, make new cables? A : All that and much more. Tom did an unexpected interview in Lucca, 2013. Q. How often and how do you clean the guitars ? A : Every chance I get. When it comes to acoustic and vintage instruments particularly. You want to get body oils off the guitar as soon as possible. I wipe the necks and body where the arm comes into contact with the guitar all the time. As far as fret boards, fret polishing, tuning machines, pots, switches etc, AS NEEDED. Q. Do the strings need something special and how many times do you have to replace them, new strings take a couple days to dampen out before they’re really playable I suppose? A : All things are not equal here. Some instruments need new string daily as others are better sounding after they are played a bit. It’s a work in progress you might say. And again it's up to the players needs as well. Q. How do strings affect the tone? A : So many things can effect the tone and strings are just one of them. Q. Can you explain what a pickup resistance does? A : Resistance is a form of measurement not something that DOES anything but a reading via a ohm meter giving a value to the resistance of a DC current thought a given circuit or in this case the windings of a guitar pick up. Q. I think Mark Knopfler’s band don’t use a wireless system, is it because it could effect the axe tone or what's the reason for that? A : If a wireless is necessary I have no problem using one however a short good quality cable is always my first choice. Q . Of course you have to anticipate every guitar change, tuning and equipment malfunction during the show , how do you handle that? A . With grace and confidence. It is about the careful prep work and trying to anticipate all the possible scenarios. Q. I suppose you receive a note with every song that will be played, which guitar will be used and the settings for the guitar? A : Notes and more notes is the best way to go. I will give Richard a guitar set for the start of a particular song. Sometimes the time between songs are so short and there is no time for Richard to check pick up switch position or tone knob setting. And of course he starts some songs so it's got to be right from the start. Q. Beside Mark Knopfler for which bands did you work also in the past? A : : I have been more then fortunate to work with many of the best artists and nicest people in the business. A small snap shot of my past is: Judas Priest, The WHO, Blondie, Mark Anthony, Eric Clapton Band, Elton John, AC/DC, David Bowie, The Blue Man Group and of course The Mark Knopfler Band. Q. What are the best and worst parts of your job? A : Best part- the sence of pride that comes along with the job and knowing what you do means so much to the people you work with and for. The worst- being apart from the ones you love. Q. I suppose touring can be pretty exhausting. MK’s band members are using gym and more to stay fit. I suppose you have less time, how do you handle with being tired? A : like the gym. I do yoga, most gig mornings. I find it helps a lot physically and lessens the back problems that have been a problem in the past. Q. Are you travelling together with the road crew? A : Yes, crew always travel together and separately from the band. Q. : Is there always someone to keep an eye on the instruments during load in, load out, travels? A : Not sure how to answer this but you can say the guitars are always made safe. Q. Being Richard’s guitar tech is not an easy task since Richard's guitar changes (from archtops and tiples to high strung acoustics and Les Pauls) and tuning requirements are the most complex on the stage in my opinion? A : It is a handful but that’s what make things exciting and challenging. Tuning a Tiple, Cavaquinho or Bouzouki while the band is rocking out on stage is no easy task but the accomplishment is that much rewarding. Q. I believe Richard’s set up in the past was something like this : a Vox AC-30 as the main amp, a Tone King as a smaller amp for steel. Temolo pedal, delay pedal, volume pedal and an over drive pedal. The most part it’s straight guitar into the amp. It’s the way he records as well. Is it still that way at the moment? A : Yes, a straight forward Electric set up. Q. What type of microphones are used on the acoustic instruments? A : We have been using both bridge under saddle pick up and DPA 4099 mics on all Richard’s acoustic instruments. Q. Of all the guitars Richard uses during the course of a tour, which do you prefer and why? A : His Tele. We are both the same age. Q. Is there another guitar that you prefer that is not on tour with Mark Knopfler? A : My American Standard Tele and my Knopfler signature Strat. Q. 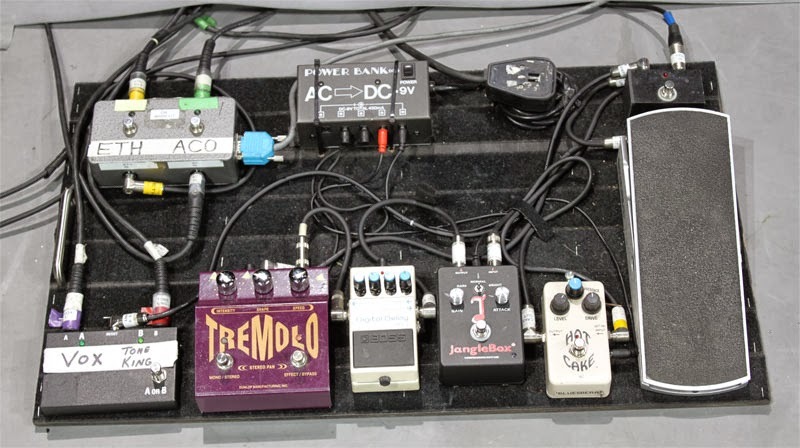 Can you tell us some details about Richard’s pedalboard? A : There is not much to tell, very few pedals and of course the settings are his own and not for public consumption. Q. How many guitars do Richard and Guy bring on tour? A : It changes with each tour. I have looked after 12 to 26 instruments on different tours. Q. I remember that Richard once had a broken string on stage, what do you have to do in that case,do you work with backing instruments? A : We have spares but not for everything. I will change strings in order to prevent that from happening but even if you change every day you still can break a string for other reasons. Q. What are the most pleasant things and the most boring things about touring for you? A : It’s great to go to new places and experience new cultures. There are lots of boring times, waiting for trucks, waiting for hands, waiting for lights, waiting for sound, waiting, waiting, waiting. Q. Are all the guitars used by Richard his own or are they also from Mark Knopfler or others? A : Mark likes for Richard to play what was on the recording so if it was one of Mark’s guitars on the CD it’s one of Mark’s guitar on the stage. Q. Of all the gear you've had over the years, what would be your most prizepiece of equipment? Q. A nightmare would be a damaged instrument, did it ever happen to you? A : Not to me personally but things get knocked from time to time. They are tools of the trade and travel the world over. Q. If Richard brings in the pedal steel, what’s the extra job for you? A : It’s an instrument and get the same care and attention that all the instruments get. Q. Had you ever dealt with instruments like pedal steel, cavaquinho, tiple, bouzouki prior to your involvement with Richard? A : My first pedal steel experience was back in 1998 with John Jorgenson in Elton John’s Band. Cavaquinho, tiple, bouzouki that’s all Richard. Q. What type of instrument repairs are you comfortable doing and not doing? A : I’m comfortable with most repairs however some things are better done in a shop where the tools, jigs and parts are readily available. Q. You've been on the road with these guys for a while now. What's your favorite song to hear night in and out, or are you so focused on Richard and being ready for any possible problem, that you really don't have time to get into the show? A : Too much to mention. Q. How would you characterize your relationship with Richard and the rest of the band? A : It’s wonderful having such a great bunch to work with. The best bands and crews are like a family on the road. Q. Is there a difference for the guitar tech concerning his work playing in or outside, what’s the easiest thing? A : The both have their challenges but weather due to the outdoors is the most challenging. Q. During the television recording in Maidstone (May 2013) there were a few guitars out of tune, don’t think that happened before. Mark and the band stopped playing in a few tunes. I suppose the guitars rang out of tune because of lamps, a heater or a cooler? It took some time to fix it? A : What you mentioned above is a short list of possible problems, sound fix in the house such as Doppler effects from the room itself and so many more. You have to persevere in situations like that. Q. What’s the worst experience that you had (regarding tuning a guitar and more) during all your tours and gigs? A : Temperature change, temperature change, temperature change. Q. If you could choose, for what artist would you like to work once in the future and for which reason? A : Jimmy Hendrix. I know that's not practical but who knows what the “beyond the grave” is really like. "Tom Calcaterra has been my wing-man (with the exception of a couple of tours) since 1996. I wouldn't be able to do a show without him and I mean that seriously. I know when TC hands me any instrument it is perfectly tuned and tempered. I always have complete confidence that every piece of equipment works and if something should go wrong, he's got the solution at hand. Tom's one of an elite group of people that do this type of work and is well known among them and in the business, for good reason. If that isn't enough, he's also a wonderful guy and a good pal. Here's to you Tom and thanks."